Earlier this year Dappros has announced the CryptoSLA product. CryptoSLA addresses the problem of monitoring and health-checking of blockchain infrastructures. This functionality is essential for blockchain infrastructure and blockchain software product providers aiming to provide reliable service, target higher uptime and lower incident resolution times, as well as verify and demonstrate their adherence to SLA (service layer agreements) currently in place with the clients. CryptoSLA product can also be used independently by customers, users or research groups who would like to monitor the health of both centralized and decentralized infrastructures that they use. This is why we have set the direction of cyber security high on our to do list. Dappros is proud to have industry famous cyber security experts as part of its advisors team, however we also recognise our experience is not enough to properly address the challenge. We shall work with partners who already have industry leading product and service teams possessing deep knowledge and track record in this space. Bringing our understanding of blockchain technology and cybersecurity together, we will jointly help the ecosystem deliver enterprise grade blockchain powered solutions. 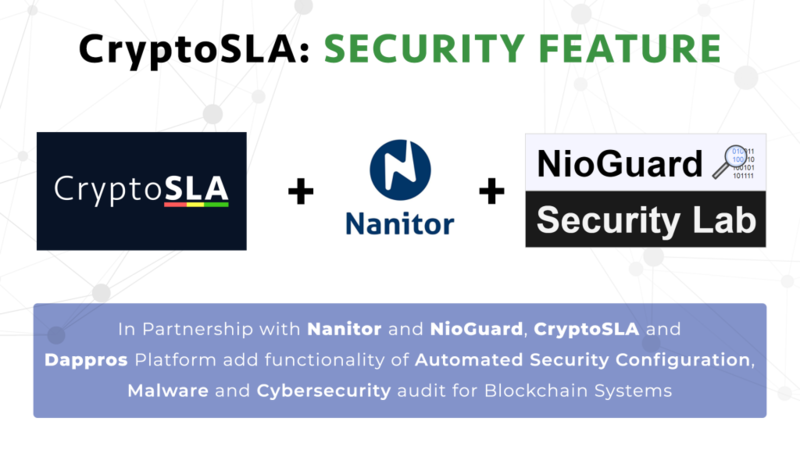 Dappros is excited to announce our partnership with Nanitor and Nioguard aiming to deliver an ultimate package of products and services addressing both SLA/monitoring and cybersecurity aspects of blockchain infrastructures. Nanitor is an industry leading product providing benchmarks and compliance tests for security configurations. It implements 38 benchmarks from CIS (each of them implementing up to 263 best practice rules). It is capable of handling multiple devices and operating systems visualising results in reports and dashboard UI. “Detailed best practice information is available per configuration rule. Information pertaining to description, rational, remedies and impact for users is available per rule.” Nanitor product provides detailed audit report as part of its functionality. Nioguard Security Lab is a group of industry and academia experts focusing on malware research and provision of cybersecurity education to enterprises. Nioguard joins our initiative to jointly research security vulnerabilities within popular blockchain infrastructures such as Ethereum and Quorum including potential cybersecurity threats introduced by platforms and products running on these infrastructures. As part of this initiative we offer free initial consultation in regards to cyber security of your enterprise blockchain solution. Please book a call for a consultation. You may also use same contact form if you wish to join a newsletter and become a beta user of the SLA and security monitoring product. Just mention “blockchain cybersecurity” as part of your request.